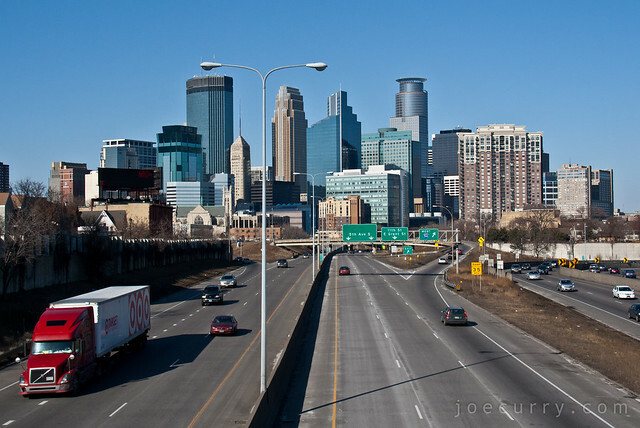 Heading northbound on 35W, the drive into downtown Minneapolis reminds me a lot of the Emerald City. From the outer ring suburbs at night, you see an equivalent yellow brick road with street lights dotting a winding road and leading to a skyline that appears to rise on a hill. From the promise it held as an aspiring college freshman to today as an adult returning to work downtown, I never grow tired of seeing this view. P.S. The Target semi truck was completely coincidental. This entry was posted in Minneapolis and tagged minneapolis by Joe Curry. Bookmark the permalink. Having the Target truck in the photo is a hoot. There is no way you could predict that! Too funny.